Some life-threatening health conditions develop quickly and dramatically, but others sneak up on you gradually. The latter is more common with most liver diseases affecting Americans, typically developing over many years -- often without obvious symptoms in the early stages. But make no mistake, liver disease is serious business. Long-term liver disease and cirrhosis are the 12th leading cause of death in the United States, according to 2013 statistics published by the Centers for Disease Control and Prevention. The early stages of liver disease are marked by changes in the liver cells, followed by tissue damage and inflammation that trigger liver scarring. Changes within liver cells represent the earliest, triggering event in the development of liver disease. In the case of viral hepatitis -- such as hepatitis C and hepatitis B -- viruses travel through the bloodstream and invade large numbers of liver cells. Once inside the cells, the viruses disrupt normal functions as they set up shop to produce new viruses. These new viruses then invade neighboring liver cells, spreading the infection within the liver. With noninfectious liver diseases, substances accumulate in liver cells in abnormally large amounts. In nonalcoholic fatty liver disease, or NAFLD, fat buildup occurs within the liver cells. This increasingly common liver disease among Americans is frequently found in people with obesity and/or type 2 diabetes. Fat buildup within liver cells is also characteristic of early alcoholic liver disease. Abnormal buildup of iron within liver cells, such as with the hereditary disease called hemochromatosis, is another example of abnormal accumulation that can incite liver disease. With both liver infections and abnormal liver cell accumulations, these initial events often lead to liver tissue damage. Disruption of normal activity within the affected liver cells commonly leads to their death. 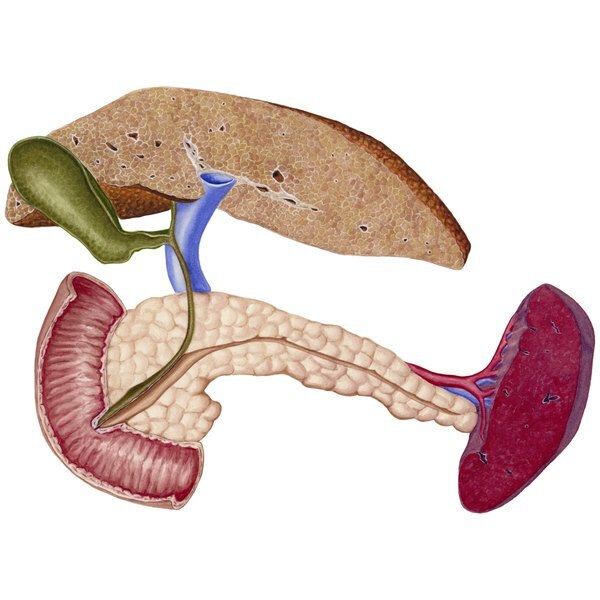 When liver cells die, their internal contents leak into the bloodstream. An enzyme called alanine aminotransferase, or ALT, occurs in concentrated amounts in liver cells. Detection of an elevated ALT level in the blood is often one of the first signs of early-stage liver disease. Liver cell death and viral infection -- alone or in combination -- signal the immune system that something is wrong. The immune system responds with a normal reaction called the inflammatory response. In the short term, this response serves as a red alert within the body. This results in recruitment of legions of immune cells to the site of injury to fight possible invading germs and clean up and repair tissue damage. However, if the inciting source of injury cannot be controlled -- due to failure to clear the infection or an ongoing source of liver damage, such as fat or iron in the liver cells -- the inflammatory reaction becomes chronic and detrimental. With ongoing destruction of liver cells and chronic inflammation, scar tissue forms in the liver. This formation of scar tissue is known as liver fibrosis. Because the liver is highly resilient, small amounts of fibrosis do not significantly disrupt overall liver function. Over time, however, the amount of scar tissue builds up if the cause of the liver injury is not eliminated or stopped. Large amounts of liver fibrosis can eventually lead to late-stage liver disease, including cirrhosis -- distortion of the liver by scar tissue -- and eventual liver failure. Fundamentals of Inflammation; Charles N. Serhan et al.